It is the one month anniversary of the launch of Knife Rights and it seems like a good time to update you on progress to date. Reaction to the SHOT Show launch was very good, especially considering we had only a couple weeks over the holidays to get ready and couldn’t schedule a press conference on such short notice. We gave out about 6,000 KnifeRights.org buttons and it was hard to look anywhere without seeing one or more pinned to an attendee’s badge holder or shirt. 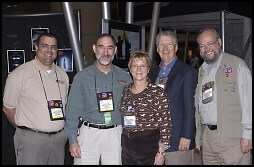 You can see how well those red, white and blue buttons stand out in this shot of the Knife Rights Board of Directors with Sandy Froman, NRA President and our first Cornerstone Charter Member (L to R: Alan Romania, Doug Ritter, Sandy Froman, Tom Gresham and Ethan Becker). We are getting a steady flow of visitors to the site and converting about 2%, which sounds miserable, but in fact is not too bad. To date almost 85% of the traffic is generated from some of the online knife related and firearms forums and the Equipped to Survive site. The remaining is coming from various blogs and Google. What is most gratifying is that 50% of the members are opting to upgrade their membership to a higher level. Over 90% of the members also belong to the NRA, which is about what we expected. 50% of our members own more than 6 knives. We have discovered more than a few bugs in the online membership and payment software that we are working to rectify. I apologize to those of you who have experienced any difficulty signing up and paying for your membership. All I can say is that some teething pains are to be expected, but we share your frustration. We have purchased a professional non-profit member management software package and Sue is working to get it and the accounting package up and running by the end of this month. This will enable us to better communicate with you and better manage our finances. Meanwhile, we are starting to work at generating more visibility for Knife Rights. Our first efforts involve more editorial mentions, which we encourage via press releases and personal contact with editors of appropriate magazines. We expect to have some of these mentions in the next few months, but if you have an editorial contact with a gun/tactical/outdoors sports type magazine, please drop me a line so we can take advantage of your contacts. We also have started placing small display ads in some magazines. It’s all about get eyeball time and becoming credible in the minds of these readers. The bad news is that it takes a while with a three to four month lead time not unusual. 1. 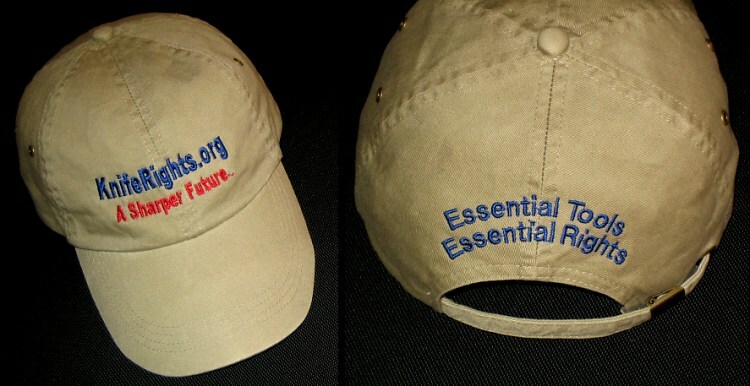 Where are the caps and membership cards? The membership cards are being designed and we’re trying to decide what sort of media to use for printing and how best to balance the cost versus the benefits to the member. However, these too should start going out about the same time as the caps, along with the decal. The design of the Knife Rights logo has been cleaned up and rendered into a useable format and the decal designed by Christopher Billick, a member and graphic designer who has generously offered his services. Christopher is also helping us with the design of the knifemaker and corporate member seals. If you have talents that we could make use of, I hope you’ll drop me an email at dritter@KnifeRights.org with your interest and experience. In coming months we’ll be working to expand our services and volunteers will play a large role in bringing these to fruition. You can help us become a bigger and better organization. 2. When will we see more content on the Knife Rights web site? This is a priority for us and we are working at rounding up the resources to provide the content at a price we can afford. We have volunteers compiling links and hope to start loading them in the few weeks. Another priority is the Knife Law section of the site. We see that as one of the most important services we can offer our members. We are currently working on various options for presenting this information in a clear and useful manner. This is not as simple as one might expect since simply presenting state statutes as written, which would be relatively easy, is often of only limited usefulness. How the law is interpreted can be critical. In addition, many towns and cities have their own laws that are stricter than state law. Legislative and news alerts are another priority. Once again, starting from scratch with a very limited budget, we can only build as quickly as resources allow. We are researching various options that could provide members this service. A forum covering membership issues and questions and for knife law questions is also in the works. We are investigating forum software offerings and looking for a volunteer to serve as forum administrator. 3. Will you be at the NRA Annual Meeting in St. Louis? Yes. We applied for a booth, but being number 79 on the waiting list, we are not holding our breath. However, regardless, we will be there. The simple fact is that we have to reach the NRA members if we are to reach critical mass. Some of our industry supporters have booths and will once again have button boxes out and we will be actively handing out our buttons and working to recruit members and spread the word. If you are planning to attend and would like to assist in spreading the word, please email me at dritter@KnifeRights.org. 4. What Knife and Gun Shows will you be attending? We are still developing our travel and promotion plans and looking at what events would provide the best return on investment. Travel costs can be significant, plus in some cases we’d have to be in two or three places at once. In many intances we’ll be depending upon volunteers to represent Knife Rights at events we cannot personally attend. For example, the Oregon Knife Collectors Show in Eugene, Oregon, is held the same dates as the NRA Annual Meeting. Member Chuck Gollnick has volunteered to represent Knife Rights in Eugene and we are sending off a large box of KnifeRights.org buttons to Chuck. If youâ€™d like to help promote Knife Rights at your local knife or gun show, please email me at dritter@KnifeRights.org. In the near term, for sure we will be at Blade Show and the Knifemakers Guild Show. I hope to post a calendar on the Knife Rights site soon; that is one of our priority projects. We are working on the design of a handout and table display for members to use at their booths and tables at events. We have secured a pop-up booth display due to the generosity of a member who prefers to remain anonymous and will be working to add display elements to it over the next few months. 5. Are you going to fight to eliminate anti-switchblade laws? Our immediate goal is to prevent further erosion of our rights to own and carry the knives we are currently allowed. That is the first priority. Beyond that, down the road when we gain enough traction, I’m inclined to believe a worthwhile and viable goal would be to emulate the NRA’s successful campaign to preempt often more restrictive local laws with state law. There’s no rational reason that some town or city should add more restrictions on top of existing state law. A citizen of any particular state should at least be able to know that as long as they follow their state laws with regards knife ownership and carry, they are safe to do so anywhere in that state. Moreover, it’s much easier to prevent adverse regulation at a state level than at the local level. Turning back time to change laws on the books, especially at a national level, is infinitely more difficult and I cannot hold out hope that this would be a realistic goal. I believe that a responsible strategy is to spend our limited resources in areas where we can accomplish the most good with the greatest chances of success. First and foremost, we must stop new laws that would make things worse. Today in our schools our children are being taught that a knife is a weapon, period. This represents an effort to change our culture, to turn it 180 degrees, to turn our tools into evil instruments of death and destruction that no sane person would have anything to do with. If we just stand by and let it happen, in a generation knives as we know them will become virtually extinct. The more laws are put into place that restrict what knives we can own and carry, the more it furthers this agenda. We will announce the winners of this membership drive in next monthâ€™s newsletter. Just encourage 10 of your friends to join Knife Rights and we’ll reward you with an annual membership renewal or equivalent credit towards a higher level of membership. The Knife Rights member who brings in the most new members in the first year will win a custom knife worth over $300! All the remaining Knife Rights members who gained a Member-Get-A-Member award will be eligible to win another custom knife worth over $300! Please forward this email to anyone you know who might be interested in Knife Rights.